An Insightful Examination of Smart Water Systems and Technology. Inland water supplies are under increasing pressure. Climate, social, and demographic change have begun tipping the balance toward demand management, as supplies begins to dwindle. Water and wastewater infrastructure will play a central role in the management of this increasingly valuable resource, and Smart Water Technologies and Techniques: Data Capture and Analysis for Sustainable Water Management provides insight on a key part of the solution. Smart water applications optimise the way water and wastewater services are used, allowing more efficient allocation of limited resources while adding flexibility to the system. Automation, real-time data capture, and rapid interpretation allow utilities and users to monitor, manage, and act on the part of the water cycle that matters to them, minimizing costs of providing service through optimal use of extant assets. Although primarily designed for water supply and sanitation, smart water systems may be applied to irrigation, reservoir and dam management, inland water flows, and more, making it a valuable asset as water scarcity begins to spread around the globe. 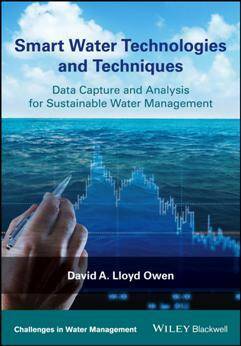 This book answers the questions, assuages concerns, and explains the technology that could revolutionize the way water is accessed and supplied.